Quails always make me smile. Would you mind if I used the first photo as a reference for a drawing (I'm not a very accomplished artist, so don't expect too much)? They are a stunning bird!! Boom & Gary of the Vermilon River, Canada. Nice, I like that bright green. With our lack of rain I have only dry grass to frame quail images. Both are beautiful. What an interesting bird. I like both-- do prefer the portrait as it does emphasize the beauty of the quali. I still love this quail photo of yours, Pat and think it will always make me smile and chuckle. Wishing you and yours a very happy new year 2012. Both are great and perfect! Fantastic image, Pat! Love the colors/patterns of the bird and the green texture of the shrub. Gorgeous bird and awesome photos. I would love to see this bird. 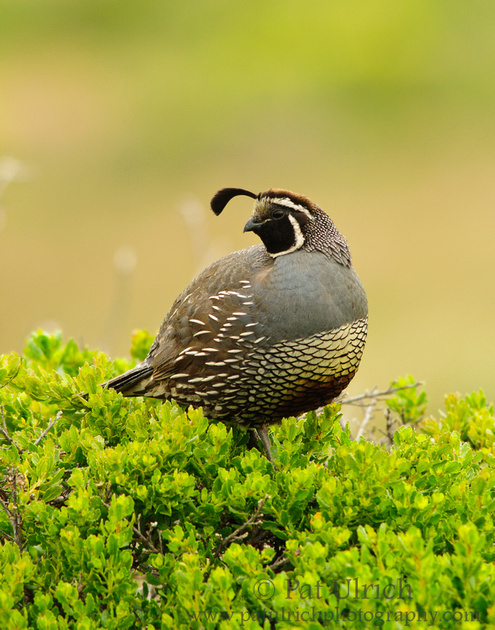 I don't know that there is a more dashing bird than the quail. It's plumage is so wonderfully complex and eccentric right to that exotic head plume. Your captures are divine and totally inspirational. A wish you equal success this year after your truly astonishing photographic year of 2011. Firstly, both shots are gorgeous as is the bird. The vertical is a portrait with the subject centrally located, the horizontal shot is more the composition of a landscape or conversation piece but both are charming. Thanks for your kind words, everyone! I'm glad you all enjoy seeing quail as much as I do. They have really been one of my favorite subjects, and Point Reyes National Seashore was a great place to photograph them. @Jedediah: You can certainly use the image as a drawing reference, and thanks very much for asking permission. WOW! Great shot. I love it! Wonderful photos. What you say about rotating the lens is true, you can feel it as you look at each photo. The clarity and contrast you have achieved is amazing. More beautiful images Pat. I love our California Quail and enjoy watching them as the male stands sentinel and the female and chicks go about foraging. The excitement of the flocks bursting into flight when you haven't noticed they are nearby can be quite exhilarating! I can't choose between these two photos. They are both gorgeous captures. I wish you good light in 2012 and look forward to more of your excellent wildlife photography.